Robert Smithson's oeuvre as described by Ann Reynolds is our Analogy. We approach this analogy holistically, appropriating for konsult Smithson's poetics. 1) The first insight is his use of abstract art as a grammar of image inquiry. He invokes the entire problematic of representation through his use of enantiomorphic projection to figure Blind Spot as the register to address. This blind spot to be mapped by konsult is not only the various forces at work in reality that are out of sight, neglected, but still within the material realm. Force in this sense obsoletes substance in electrate metaphysics, to the extent that reality exceeds objecthood. Smithson devotes numerous works, activities, installations, and performances to rendering visible the force of entropy. Our analogy at this level is to ask: what is the force operating in the field addressed by konsult? That force is the human body itself, specifically our sensory capacity for pleasure-pain, attraction-repulsion. 2) The second dimension of Blind Spot is figurative, that which comes into thought, feeling and experience only through sign semiosis expression, and this is Smithson's (and art in general) primary interest. 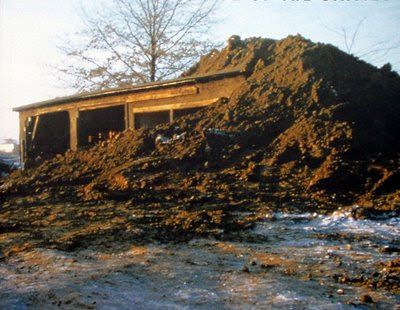 He constructs the woodshed on the site near Kent State University, covers it with loads of dirt until the support beam cracks (twenty tons), in order to demonstrate physical limit. This physical limit is a figure, a trope, as is always the case in Smithson's projects, to intimate the force of entropy across all registers of real: physical, mental, ethical, political, economic, metaphysical. He suggests: where is your woodshed? Why a woodshed, if not to invoke the idiom: to take someone to the woodshed is for punishment. 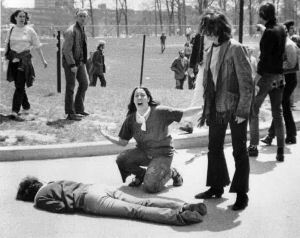 It is the luck of synchronicity that four months after this installation was completed, the notorious events happened at Kent State, when National Guard troops fired on protesting students. This historical juxtaposition just makes explicit the historical forces relevant to the question of limit, counsel, measure, decision. 3) Blind Spot, then, identifies the dimension to be mapped by konsult as that of tropology, figurative allusion, and konsult itself as a practice of reading and authoring figures. From Smithson we may learn to appropriate some feature of the consultancy field, to activate it in an image mode, to create a figurative comment. The most obvious material for this comment is the Cabot Koppers site itself -- the contemporary dilemma of pollution, contamination threatening the acquifer and the well-field, the issue of technics, in the manufacture of pine tar, and the history of this invention, including its contribution to the spice trade and colonialism. The direct analogy from Smithson is to ask after the pine tar in me. That analogy should be a point of departure for a broader review of the scene, to map a figurative ground, considering the full array of senses driving human invention.